10 fingers… 10 toes… check. I do a quick count before jumping out the car into the dry, red… so red, earth. 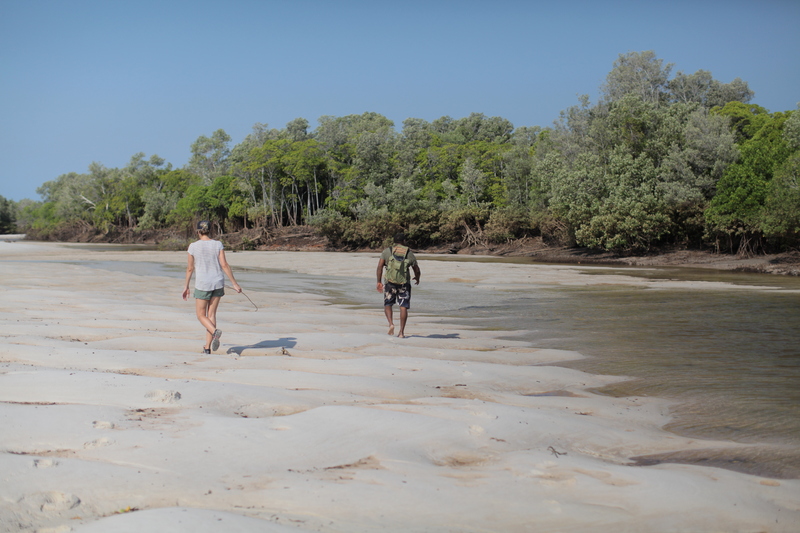 Our local Indigenous guide, Eddie, is meeting us up at the Cape Leveque, 200km north of Broome in Western Australia, to go mud crabbing this afternoon… proper mud crabbing… in the Kimberley. I’m excited, and possibly a little anxious. Whilst all my fingers and toes are in tact, I’m pleased to see Eddie’s are also as he sits roadside snacking, waiting for us to arrive. I can’t help myself, and ask him the clichéd (although I’m quite serious) “Seen any crocks lately?” Eddie jokes, “We’ll soon find out. Last time I saw one I shot it, a big one. I haven’t seen one since”. Neither of us are laughing. 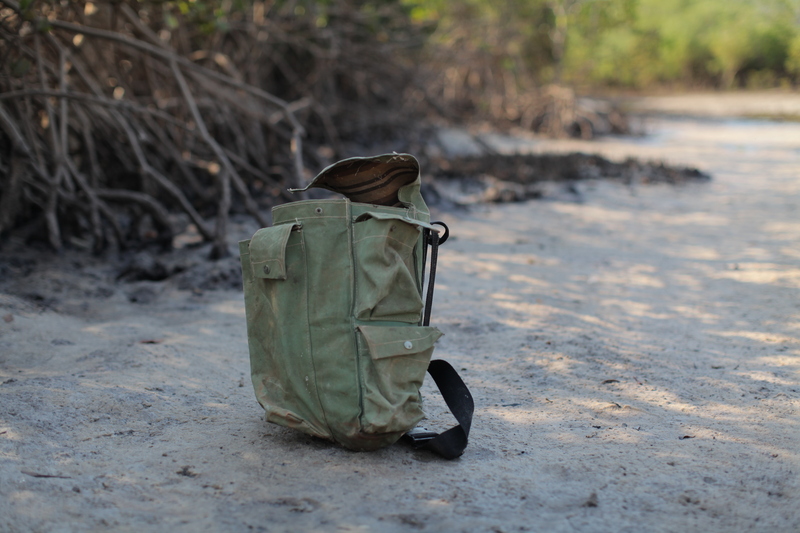 And on that note, off we walk in the searing afternoon sun, across the mud flats, armed with a ‘hook’, a knife and a canvas duffel bag, to find some mud crabs. 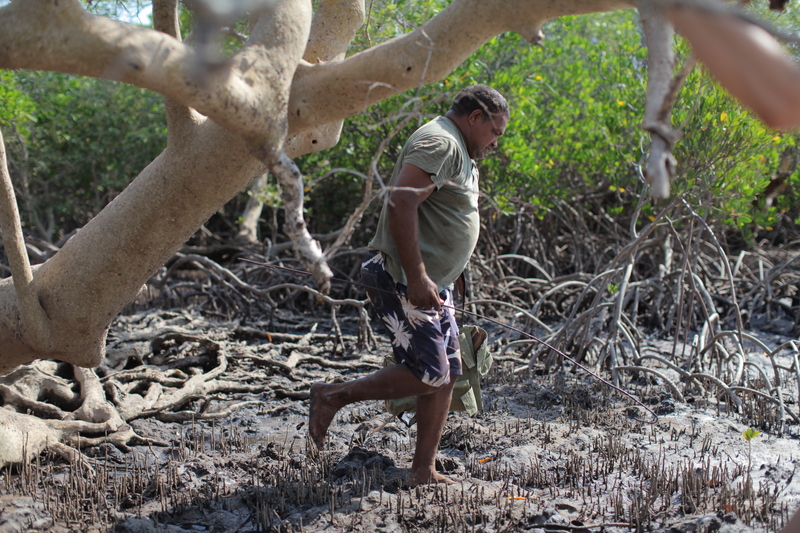 This is Eddie’s backyard we’re walking in, figuratively and literally, because he lives just beyond the king tide mark at Ngamakoon, where we are today, with his wife and children. 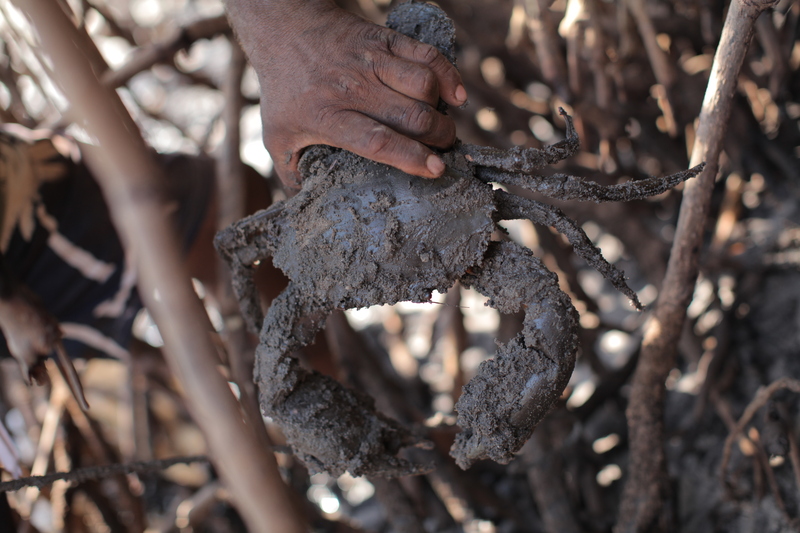 He’s been taking people mud crabbing for 10-years now, but you won’t find him in the phone book or online. 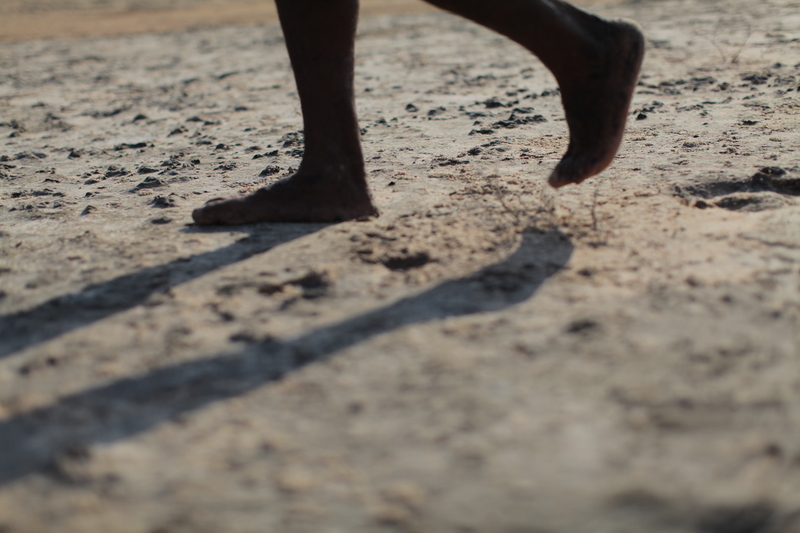 He was born in Broome, but his mother was part of the stolen generation – taken away to the dormitories when he was young – and he grew up at One Arm Point. It’s there where he works now, polishing pearl shells. 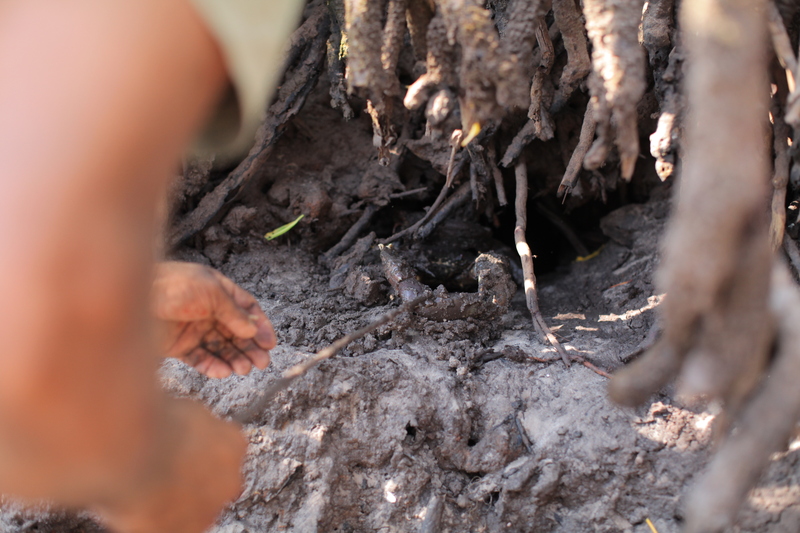 We’re 5-minutes in and already Eddie’s woven his way through the roots of a mangrove to check out a crab hole that he’s had some luck with previously. 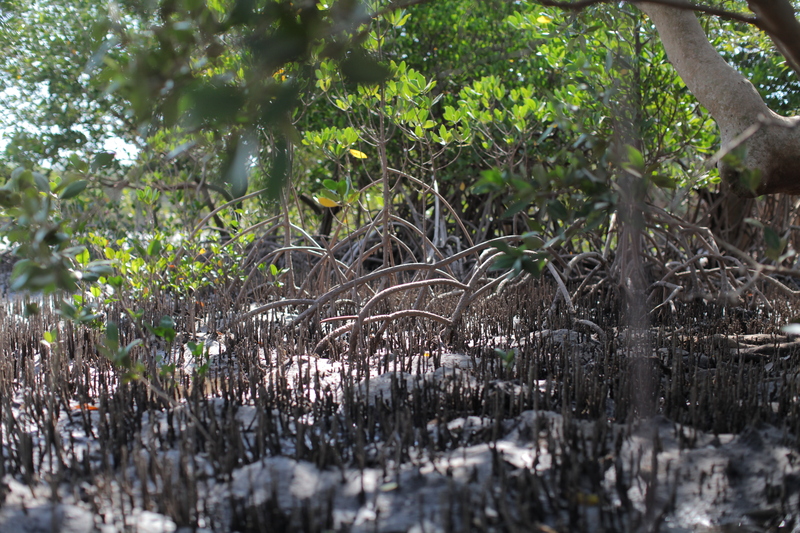 We head in after him and too become entwined with the tree, trying to catch a glimpse of our first crab. I can hear him… the snapping of his claws and the sound of Eddie’s hook across his shell. He’s not making it easy. It’s been a struggle – or “awkward” as Eddie keeps saying – he’s retreated too far back in to his hole. Eddie bends his hook in all different directions, trying to get it around the crabs elbow. But he’s gone. 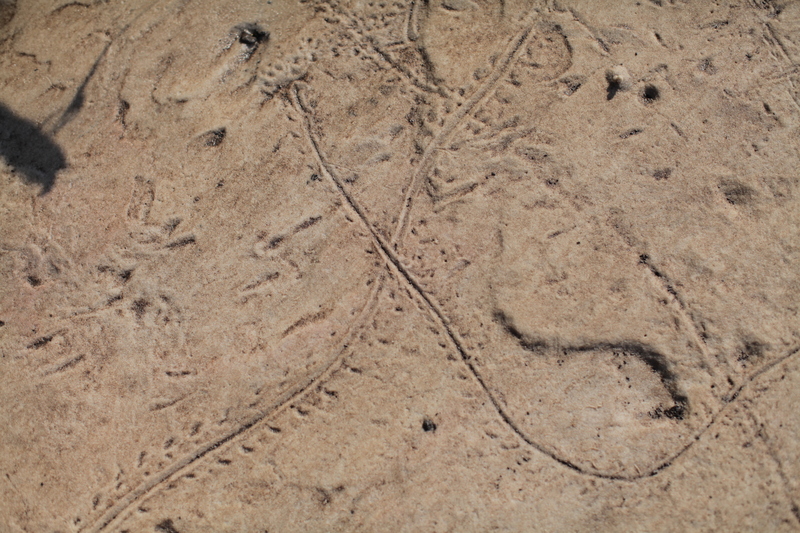 So aside from the obvious crab holes, I ask Eddie what we’re looking for – footprints, or tracks (and there are plenty of fresh ones under foot today), and water – crabs follow the tide, looking for water, so footprints plus water plus crab holes, should equal chilli mud crab for dinner! 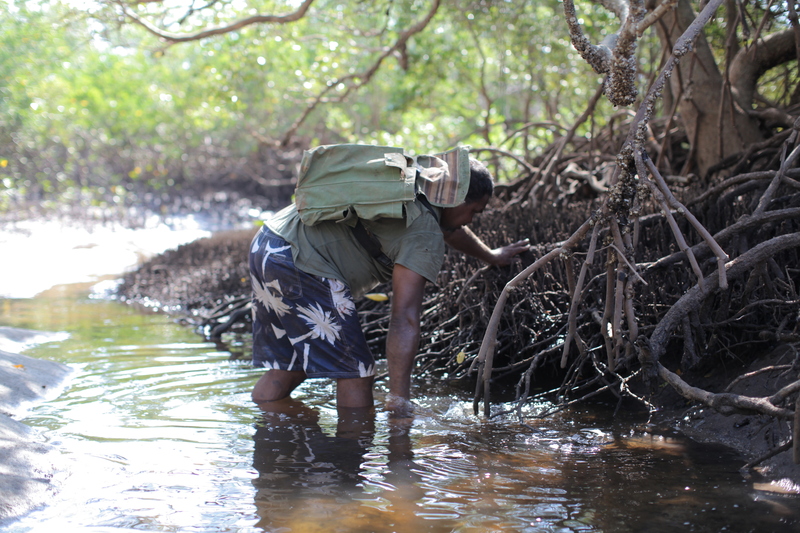 We head further into the mangroves, learning about Mango balsawood used to make boats and the seashells that you should eat to fight chest infections. 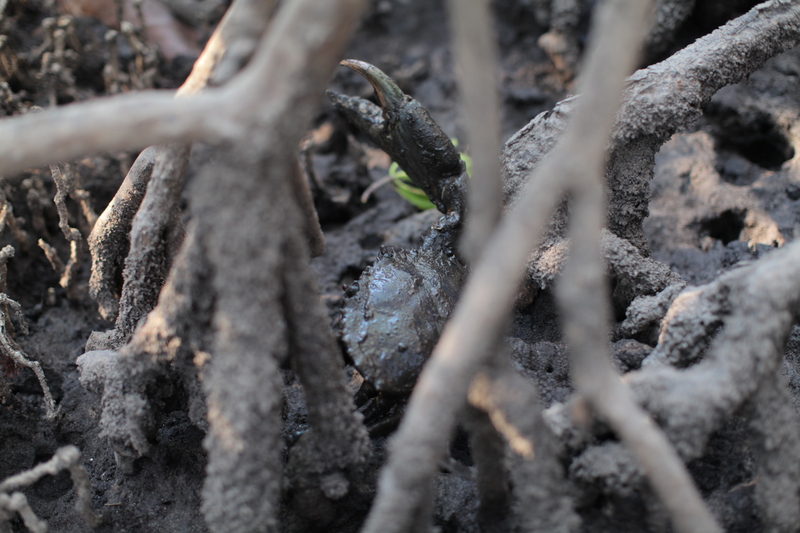 The next couple of crabs prove to be a little easier to get, spotting their blue-tinted pincers in the late afternoon sun, before they spot us. And they’re big. I can hear the weight of them in the earth fighting Eddies hook. 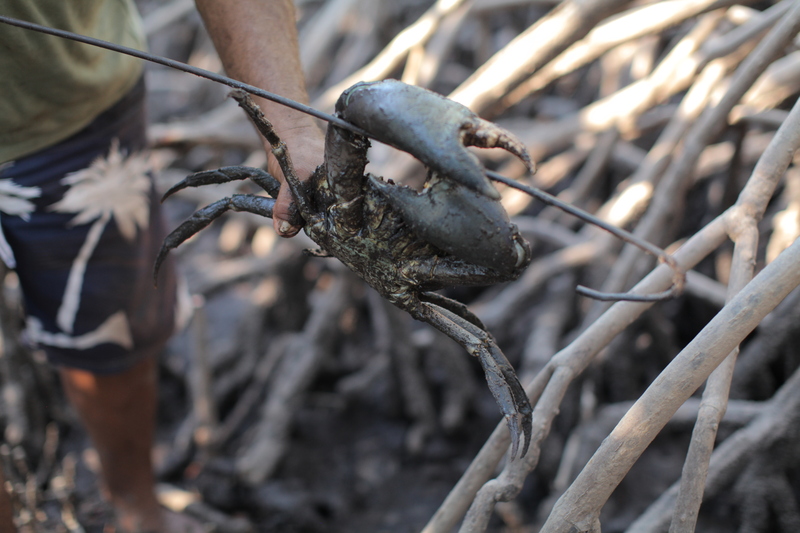 Eddie explains why they prefer to hunt like this, with a hook and not traps – if for whatever reason, they can’t retrieve the traps before low tide, the crabs can’t escape and die. And this process is about hunting for food, and only taking what is needed. 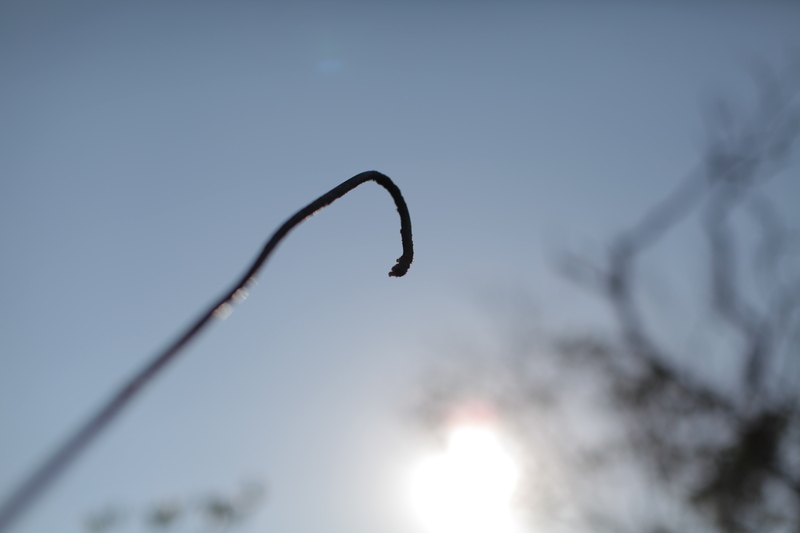 He’s had this hook for about a year – borrowed by family members, they often forget to be returned – it’s a long piece of thick wire, with blunt hooks on opposing ends, so he knows which way the hook is facing when it’s buried deep in a crab hole. 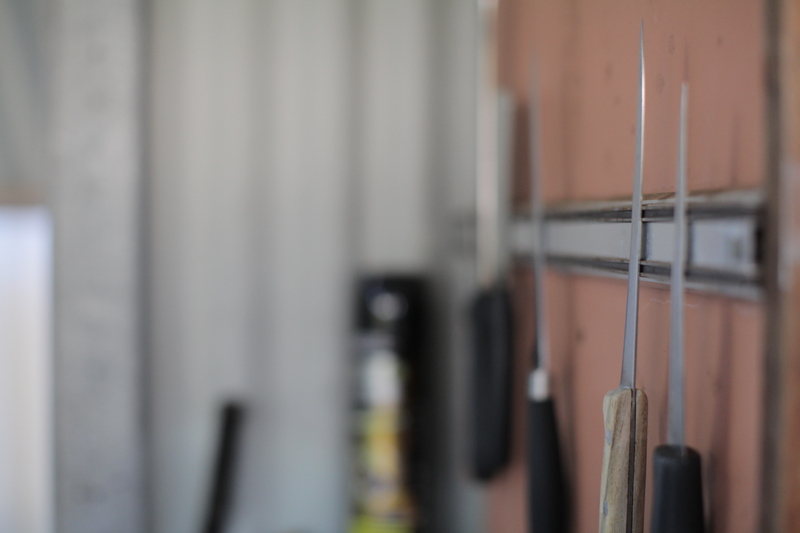 I’m a little concerned when Eddie pulls out his knife and chops the crabs pincers off before handing him to me. 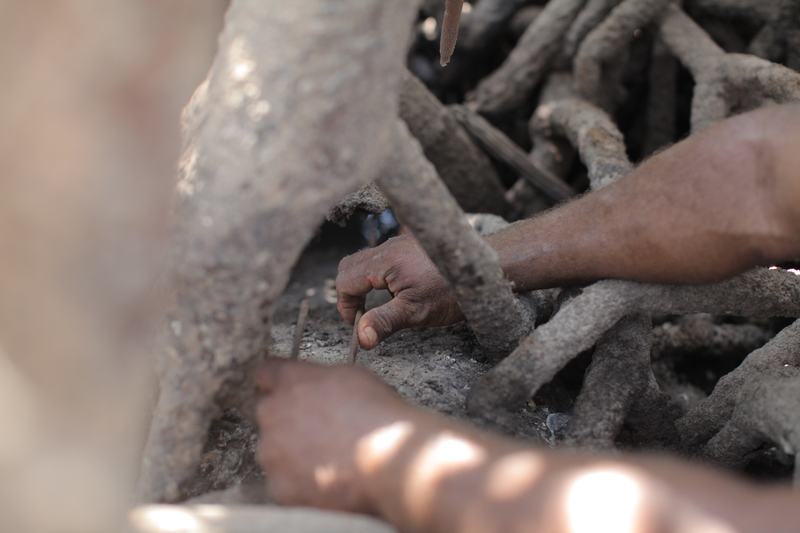 But it’s the most humane thing for us to do (there’s no rubber bands to tie their claws together out here). If he wanted to keep the claws on, he’d clip the ends of their back legs off and use it as a wedge to keep the claws closed. Sometimes Eddie’s wife will come crabbing with him, and sometimes the children will head out hunting on their own. 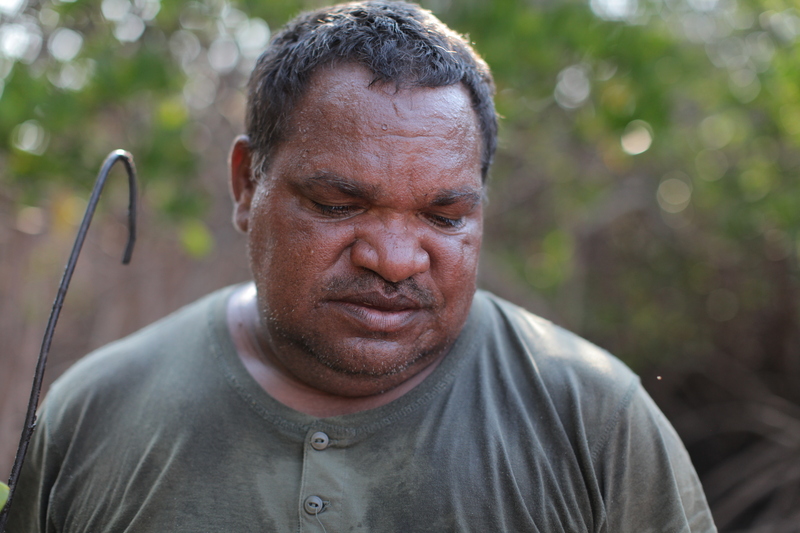 When preparing the crabs for the family to eat, Eddie cooks them on the open fire and tells me that the children and the elders are always invited to eat first, while the ‘middle group’ (he and his wife) eat last. We find another one. That makes three. 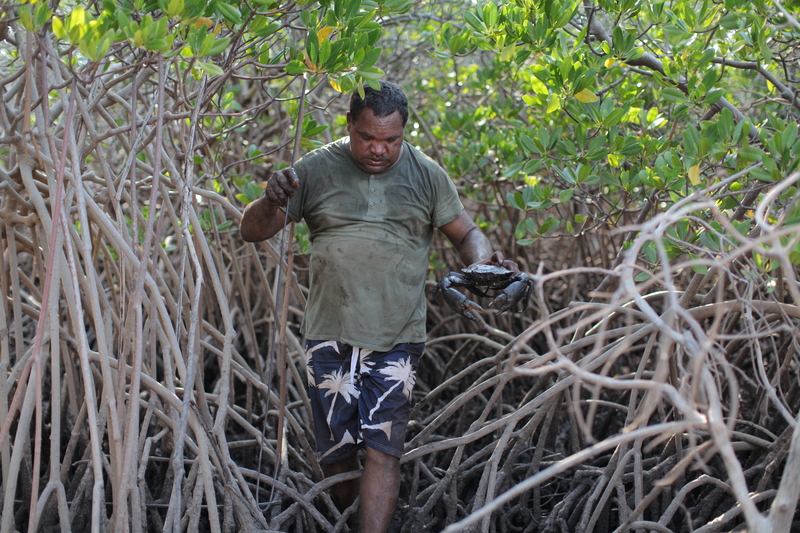 For the thousands of mud crabs Eddie would have caught over his lifetime, there’s not an air of complacency about this process for him. It’s solely about necessity and respect. The last crab hole has two crabs in it, but one is a female. Although there’ll be more meat on her than him, we leave her be. Eddie says he only ever takes a female crab if there’s been a special request from his wife, as she’ll want to cook with their eggs. Hear that? It’s the bird’s song. Eddie says that means the tide is turning and it’s our cue to get out. The tides up in this part of the world can vary by 9 meters and come in very quickly. 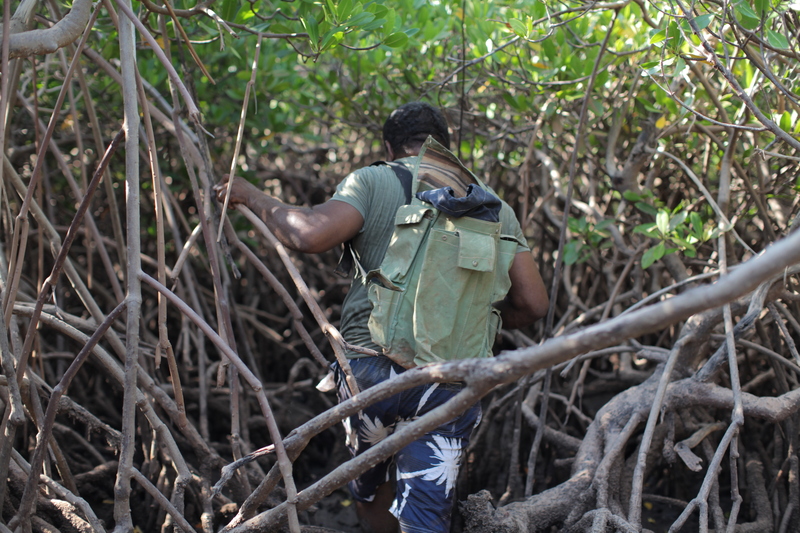 We take a shortcut back through the mangroves – there’s always escape routes planned, so the rising water doesn’t catch them out. We’ve been out hunting for a few hours now, without watches or phones. Thankfully the birds will always keep time for us. 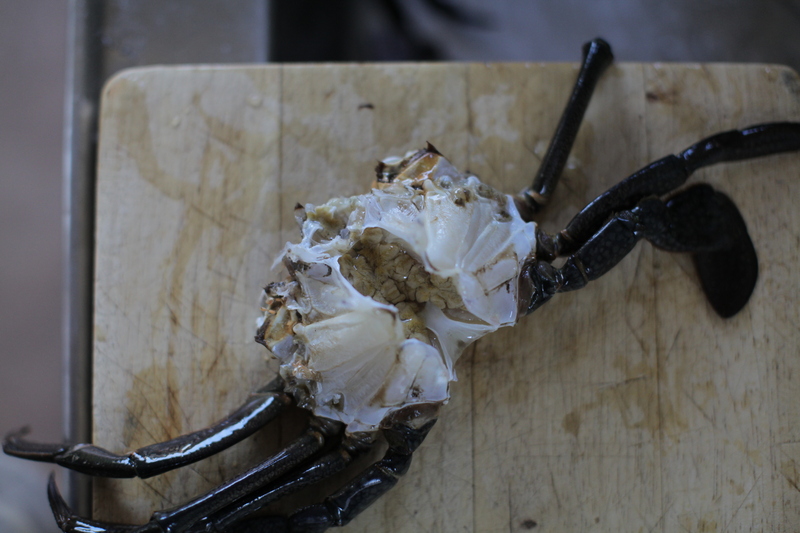 We leave Eddie one crab for dinner – his wife will be pleased. And take our three back to Broome. 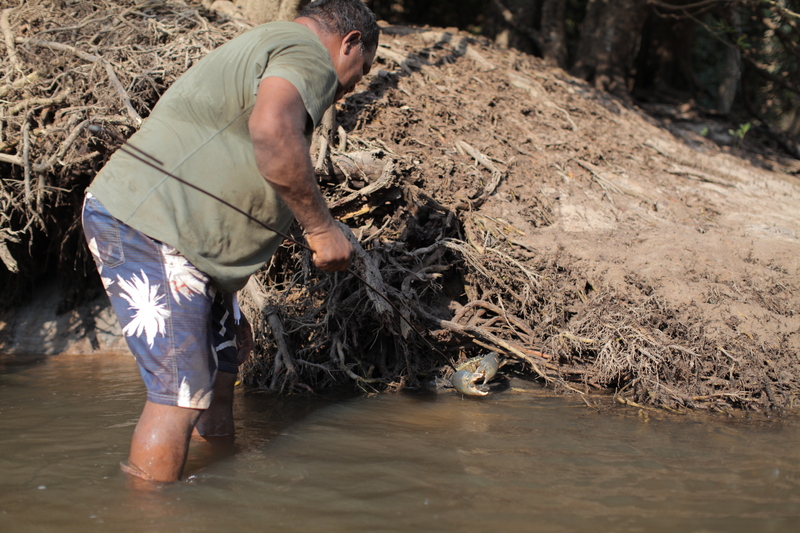 We’ve promised to cook mud crab for dinner tonight and I’m pleased to say we’re halfway on delivering. 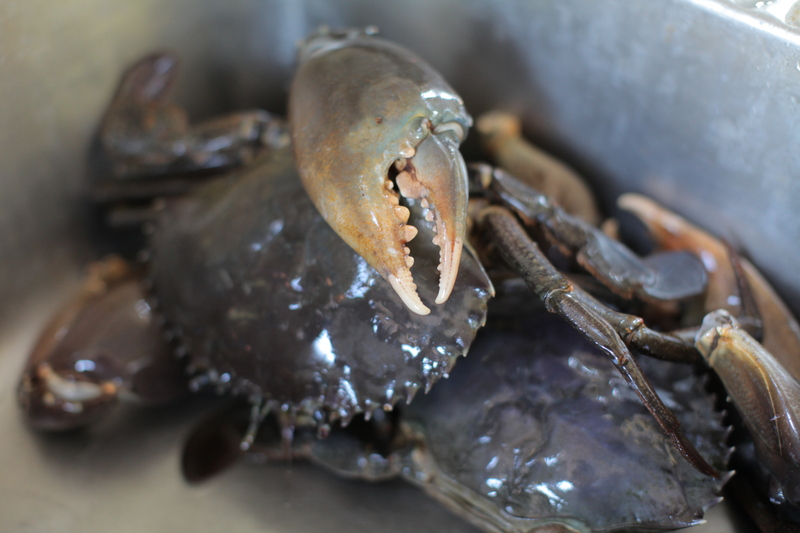 Now to meet ‘Fongy’, a friend of a friend, who we’re told makes a mean chilli mud crab. 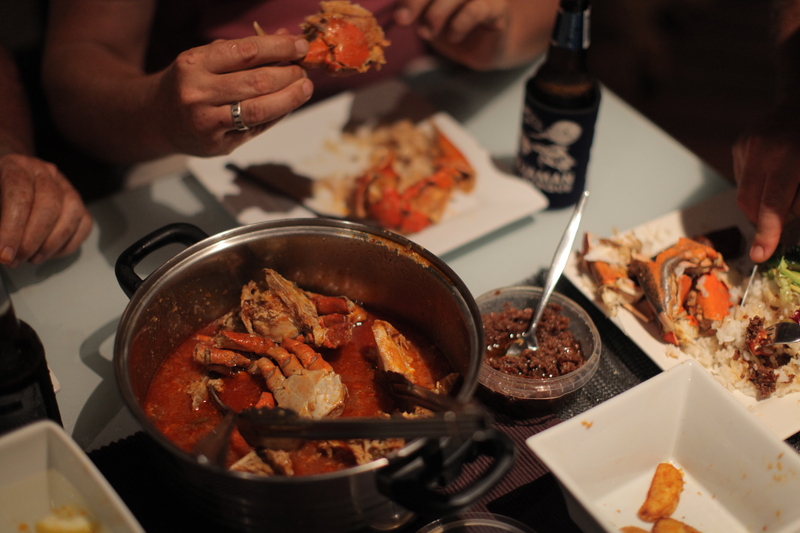 He’s John to you and me, but ‘Fongy’ to his mates, and he’s invited us over to cook chilli mud crab. Now a counselor at the local prison, Fongy used to own a seafood restaurant in Broome and this was the most popular dish on the menu. 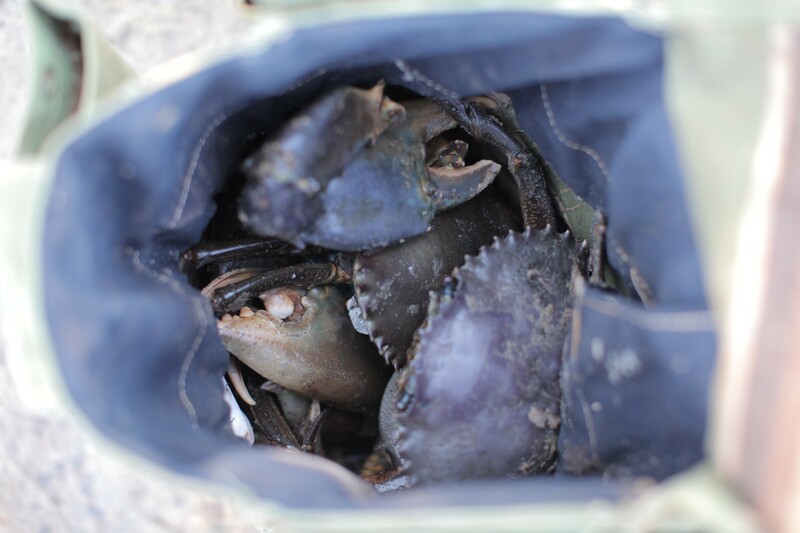 A seasoned mud crabber himself, he’ll often go out 2-days before a neap (small) tide to his “special secret spot”, with traps, nabbing a dozen at a time – so this recipe is well-heeled! 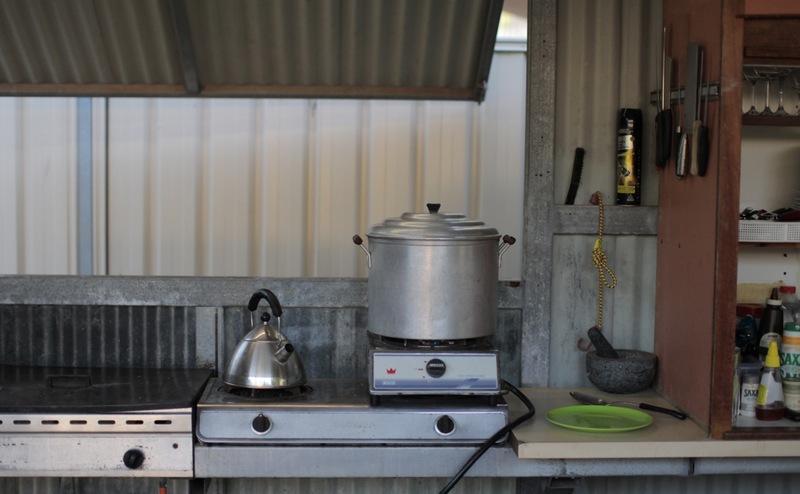 He’s got a fully equipped outdoor kitchen set up – complete with (working) Coca Cola vending machine and handmade stubby holder dispenser (because you can never have too many of them up here!). 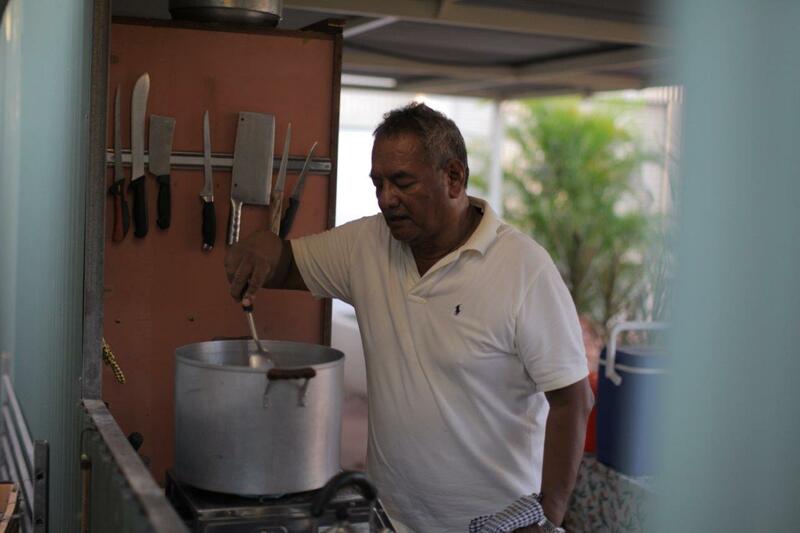 With his part-Malaysian, part-Thursday Island heritage, and a love of seafood, I can tell there’s a lot of cooking and family entertaining done in this place. 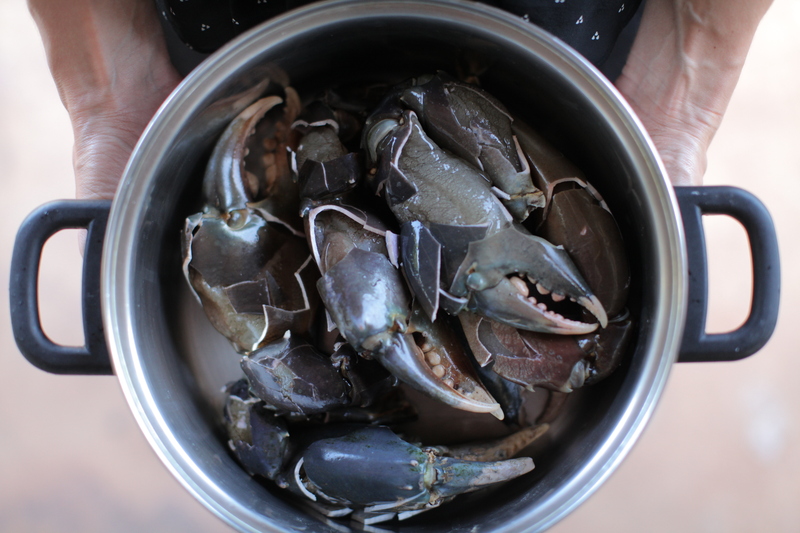 Upon first inspecting our crabs, Fongy’s unsure they’ll be much meat in them (my stomach groans with disappointment). True, there’s not a lot of weight to their bodies, but their claws feel heavy enough for me. 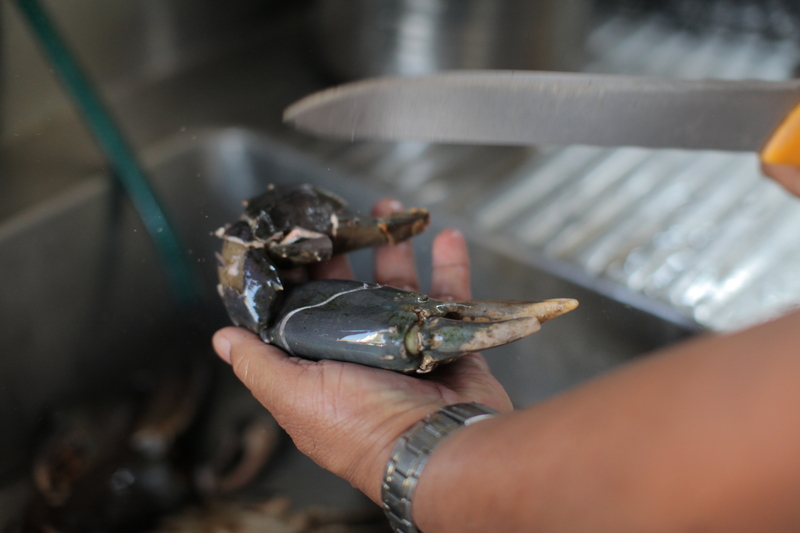 As we’re cleaning them in the sink, Fongy talks of a folk law that says if the tips of the crab claws are white, then they’ll be full of meat. And look at all those white-tipped claws! Things are looking up. 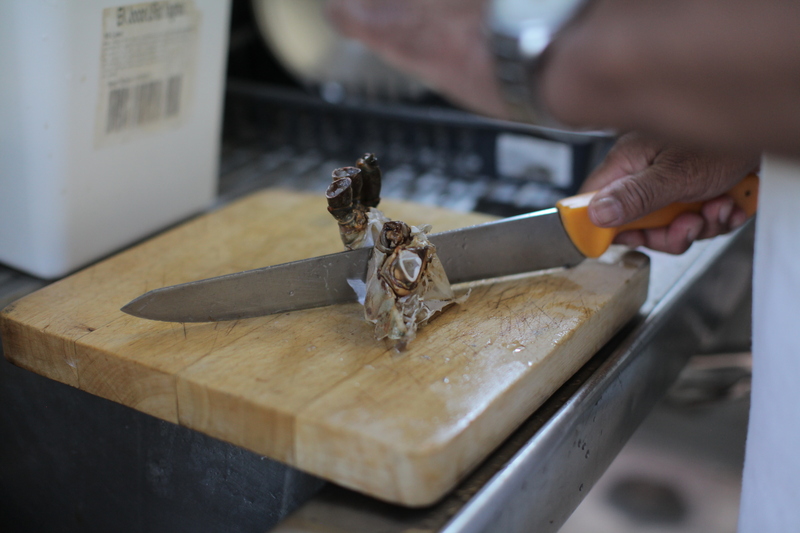 After washing the crabs and removing the gills, the crab claws are cracked, so the flavour can infuse the meat. I can’t believe the ceramic thickness of their shells – at last a few millimeters. I’m pleased to see Fongy keeps the guts in for flavour, before quartering the bodies and removing the legs. Into a large pot on the stove go vegetable oil, chopped garlic and ginger (2-1 parts respectively), and chopped green chilli (1 per crab). Allow this to cook for a minute then add the crab and mix. Pop the lid on and leave it to steam for a few minutes, then add a cup of water, dried chilli flakes and put the lid back on. You’ll know when the crab is cooked, when the meat turns opaque. When the crab is about 5-minutes away for being ready, add tomato sauce (some people use tomato paste, but Fongy likes the sweetness and acidity that tomato sauce brings). Put the lid on but don’t stir just yet. 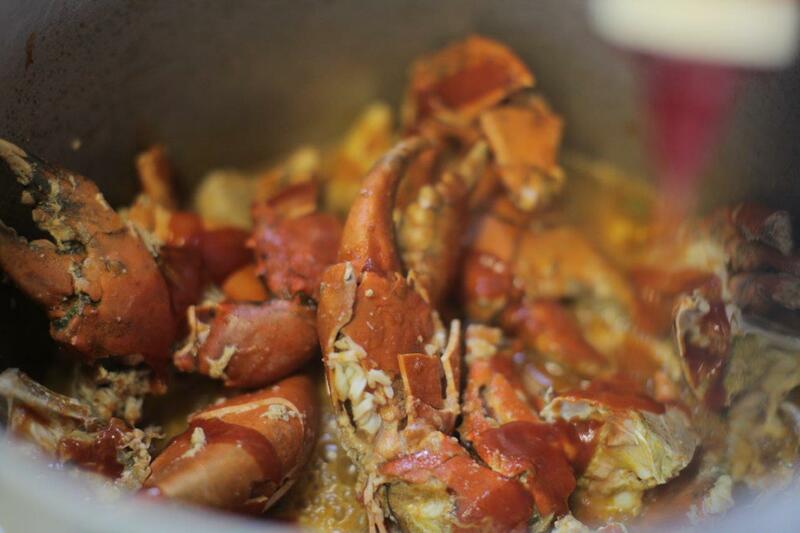 Once the crab is cooked, stir to combine the sauce and add a bit more. 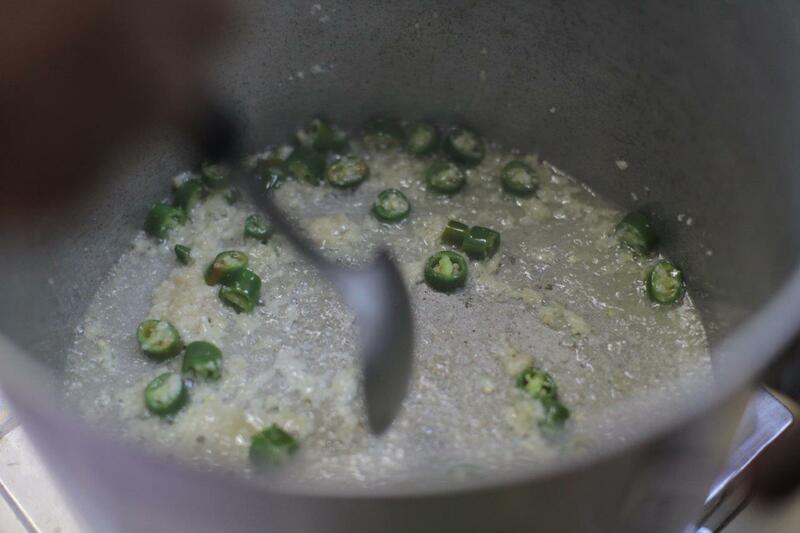 Fongy also adds some homemade chilli vinegar at this point – malt vinegar that’s been infused with fresh chilli. 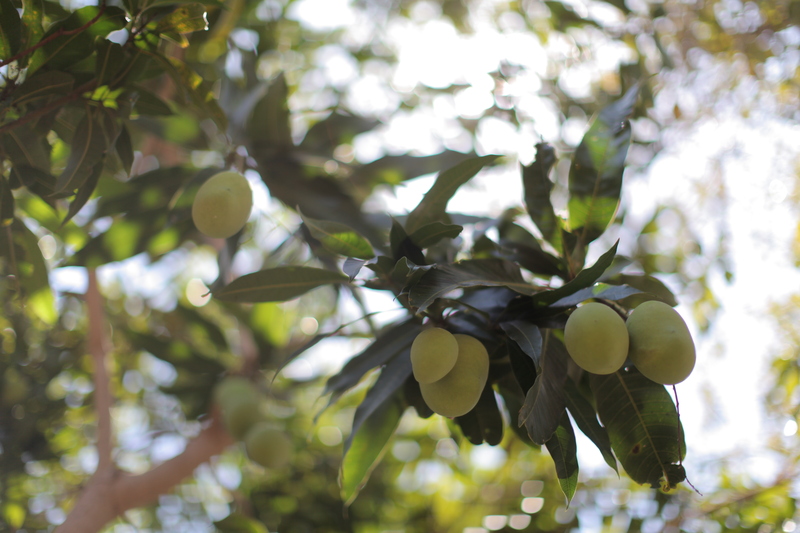 Fongy’s garden is full of mango trees, heaving with fruit – they’re not quite ripe yet, a couple more weeks. I imagine all the mangoes he must eat for breakfast, lunch and dinner, and the endless possibilities for homemade jam and chutney and cordial. Last season Fongy dehydrated the pureed fruit to make a sort-of fruit roll up. I have mango-envy. 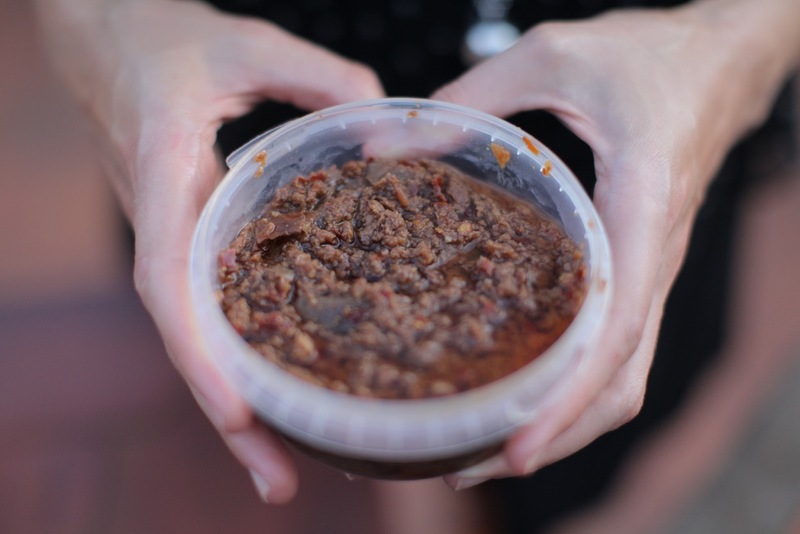 Next Fongy brings out some of his homemade Belacan (pronounced buh-lah-chan) – a pungent, dark-brown dried shrimp paste. It’s an essential ingredient in South East Asian cooking, particularly Thailand, and is used in very small amounts in soups and curries. It’s one of the most important ingredients in Malaysian cooking. It’s new to my food vocabulary and stinks like blood-and-bone, but it’s delicious – like a savoury condiment. I imagine it would be good with rice and greens and eggs. 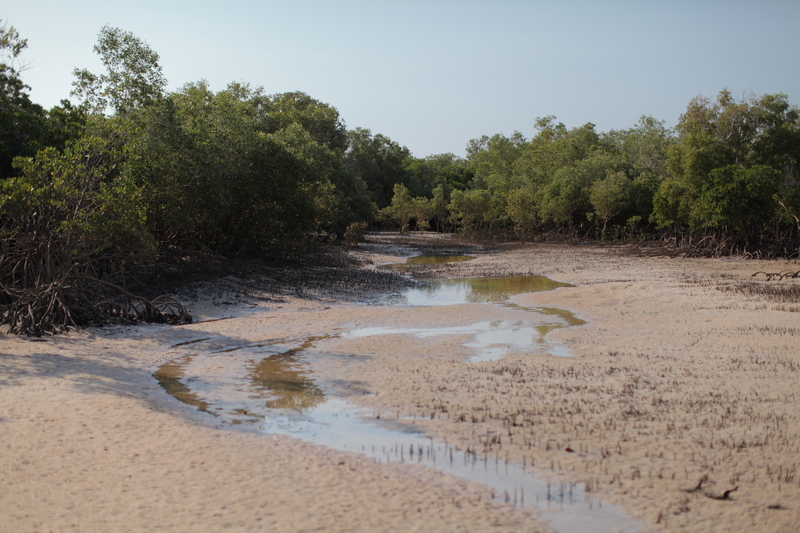 Fongy adds pearl meat to his, making it distinctly local to Broome. His homemade Belacan is in high-demand across town, so I feel honoured that we’ll be enjoying it with our chilli crab tonight and taking the leftovers (tripled snap-lock bagged) home with me. A silence drops over the dinner table for a few moments – the sign of a good meal, everybody is eating. As I drown piece after piece of white bread in the delicious chilli sauce, I know I may never be able to head out of an afternoon, like Eddie and Fongy, to catch my own mud crab again, but it certainly won’t be the last time that I cook it. 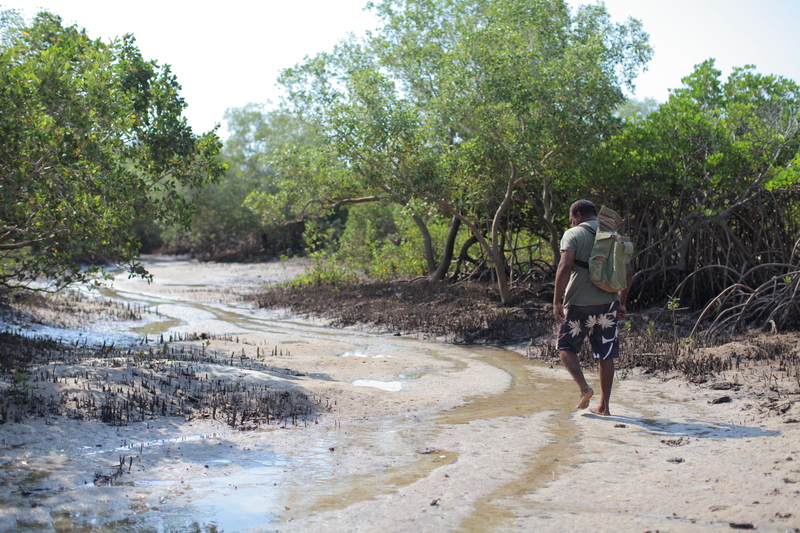 For anyone heading up to Cape Leveque, give Eddie a call and go mud crabbing. Find him through Kooljaman. 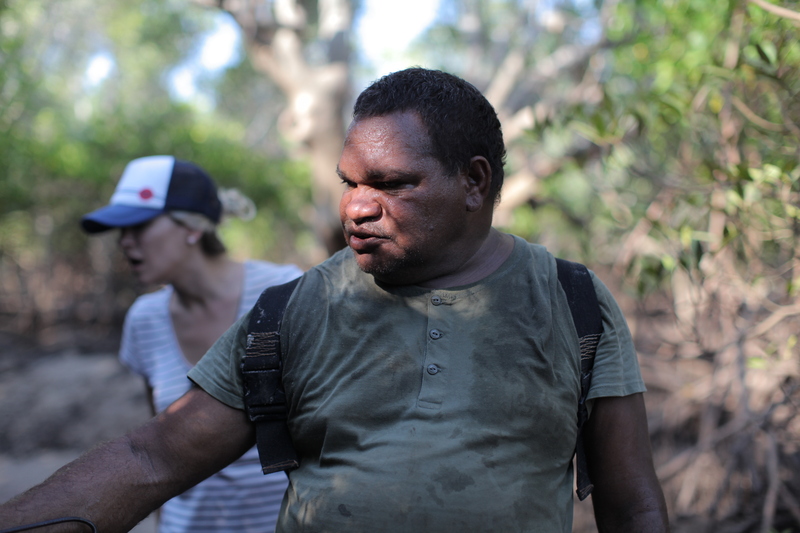 Oh, and he also does bush tucker tours – that’s next time, for me. Thank you Allen and Vic for welcoming us into your home; Fongy for letting us into your kitchen; and the gorgeous man behind the lens, for opening up the world to me – in so many ways – sharing and capturing this awesome experience. 08 Jan	This entry was published on January 8, 2015 at 2:54 pm. 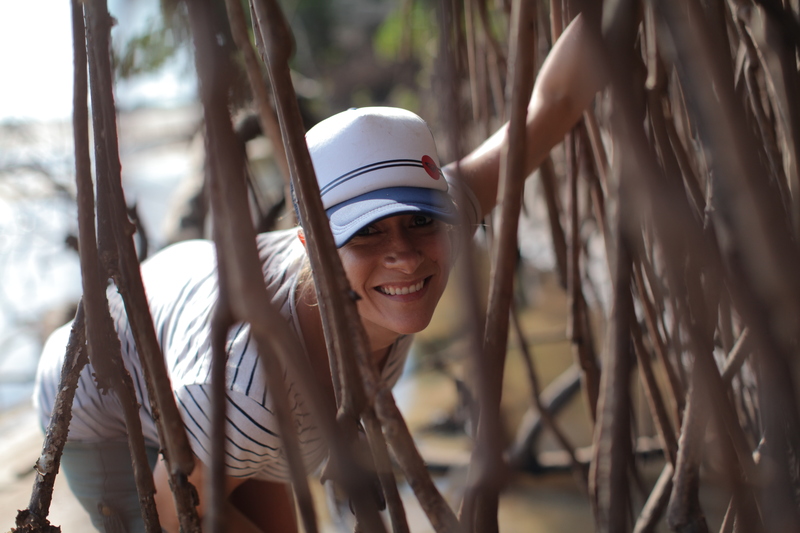 It’s filed under Lucy's plate, Recipes, Uncategorized and tagged Broome, Cape Leveque, Chilli Mud Crab, Crabs, Malaysian, Mud Crabbing, The Kimberley. Bookmark the permalink. Follow any comments here with the RSS feed for this post. That looks like a lot of fun. I dig a lot of razor, butter, and steamer clams in alaska. 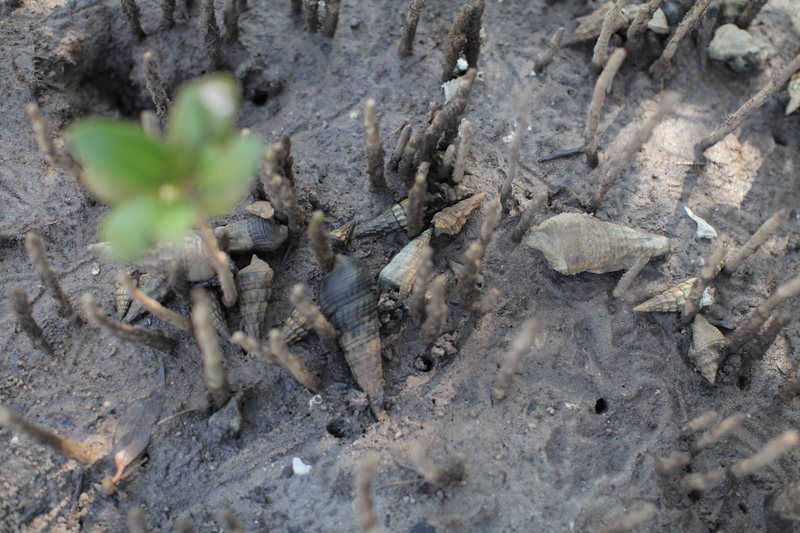 How much fun would it be to get crabs from the mud too!!!??? I bet they’re delicious!